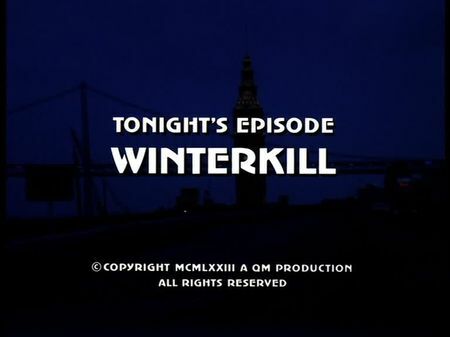 I added the screencaps for Winterkill to the episodes' page. Our two cops are quite surprised to find out that a gruff but warm-hearted senior, Wade Tillman, has decided to collect money for a friend's rent and eye-surgery by threatening another old man's company with bombs he placed inside his high-rising buildings. Both men once knew each other but made very different careers. Tillman always kept working on wages while the other, Carl Armstrong, took a lot of risks and finally made it into the big business. Literally disgusted by Tillman's initial request for 25,000 Dollars for covering a friend's eye-surgery, Armstrong sends him packing. Stone and Keller are trying to trace Tillman down before he delivers on his bomb threats. This episode is a nice journey covering locations in the Financial District, North Beach, and Pacific Heights. In the opening sequence, Tillman walks down Filbert St at Washington Square, mugging a gas station at Filbert and Columbus Avenue (now demolished). Stone and Keller are called while hanging out and having a (cold!) hot dog at Walt's Diner, an original snack bar close to the former industrial South Beach area at 7th and King Streets. The senior rest home 'Pacific Haven' is located in the Pacific Heights district, and so is the house of the smart old man (the suspected former mobster) Stone and Keller are questioning.Tillman's son has accomodation with the then all-new Hyatt Regency at Embarcadero Center, whereas the 'Carl Armstrong Building' is on Beale Street, just south of Market. Interior filming (apart from the lobby scenes), however, must have been accomplished at Embarcadero Center (as we can see One Maritime Plaza very close to Armstrong's office). Further filming locations include Ferry Plaza, SF General Hospital, and a cemetry of unknown location (may be Colma).